Students from NYU’s Interactive Telecommunications Program can get you moving with a new API-based computer program. 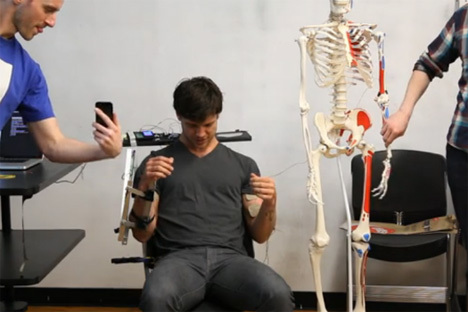 They have developed a way to control a person’s arm with a keyboard, joystick and even your iPhone. The program is called Open Limbs and is “a platform for controlling human arms over the internet.” Sound creepy? Well, the students are using it for good as an orthopedic system to help people with weak muscles. Electric pulses shoot to the nerves that are connected to the muscles, causing them to contract. One of the creators, Will Canine, demonstrated the device at the ITP annual spring show by giving his arm up to the internet, in a way. The electrodes were connected to his forearm, and when a nearby model skeleton was moved, his arm mirrored the movement. Now, maybe he can finally master doing the robot with the help of the internet and Open Limbs. See more in Weird Science or under Science. June, 2013.